Many people choose to age in place and spend their years as peacefully and comfortably in the home they’ve always known. However, leaving a senior with health concerns home alone—without anyone to keep watch over them—is a recipe for accidents and other related problems. One of the most common causes of elderly injury in the comfort of their own home is falling. When a house or building isn’t adapted for the mobility needs of the elderly, it can make even the simplest tasks dangerous to perform, risking slips and falls and other injuries that could lead to even more serious conditions should your senior suffer a bad fall. A fall alert for elderly is a useful tool that can warn you about potential falls and injurious incidents your aging loved one may be caught in. A tracking device for elderly can likewise be beneficial when your elderly loved one becomes prone to wandering off, putting them at risk of getting lost and confused. 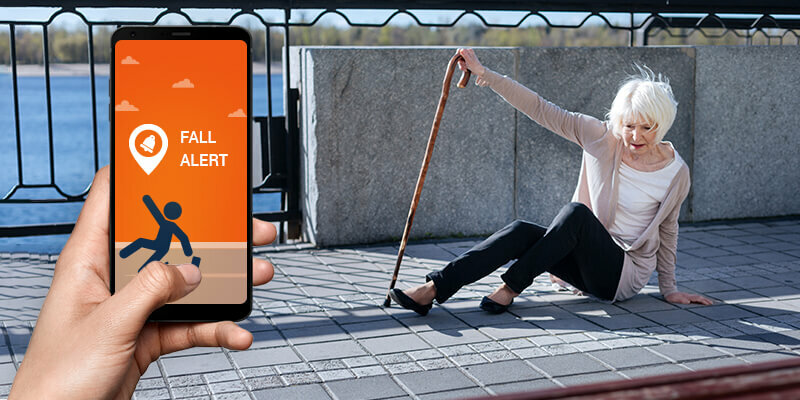 Senior Safety App is designed to act as a tracking device for elderly and at the same time provide a fall alert system to help caregivers know when a potential injury could be in development. With fall alert for elderly people, you get to prevent more serious injuries that could stem from a fallen elderly not being able to call for help and assistance, causing them to make their slip and fall situation much worse. Even minor falls can lead to serious injuries for elderly people. Keeping their environment as safe as possible – Even when you can do major renovations of the home to adapt steep stairs or remove dangerous steps in frequented areas, you can take measures in order to reduce slip and fall risks at home. This could mean keeping mostly visited areas of the home dry and free from debris and clutter and maintaining good lighting in all areas of the home. Keeping your seniors away from baggy clothing can also help reduce the risk of falling at home – Better fitting clothes eliminate tripping hazards, without compromising their comfort. Discussing their health conditions and keeping their health appointments – This can help prevent their conditions from progressing, especially those that reduce their mobility, like waning eyesight and diminishing muscle strength. If you are worried about the safety of your loved ones, Senior Safety app is the most preferred app for its smart features and practical design. Over 1 million people across 97 countries are utilizing this app for the elderly to ensure that their loved ones remain safe.